Therminol 62 is a synthetic heat transfer fluid whose chemistry is custom contoured for high-performance, low-pressure, and exceptional thermal stability. 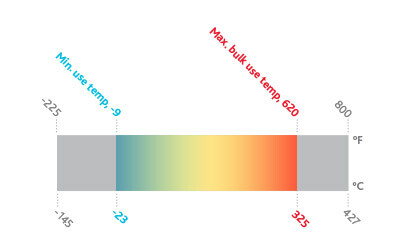 True 325°C (620°F) Performance—Users can expect many years of reliable, trouble-free operation, even when operating continuously at the recommended maximum temperature. Low Pressure—Therminol 62 is designed for typical liquid phase heat transfer fluid systems which operate at low pressures. Fouling Resistant—Therminol 62 is specifically engineered to resist solids formation and system fouling. Your system will operate more reliably and you will save money.